Heat oven to 375°F. In large skillet, melt 2 tablespoons butter over medium-high heat. Add chicken; cook and stir 3 minutes. 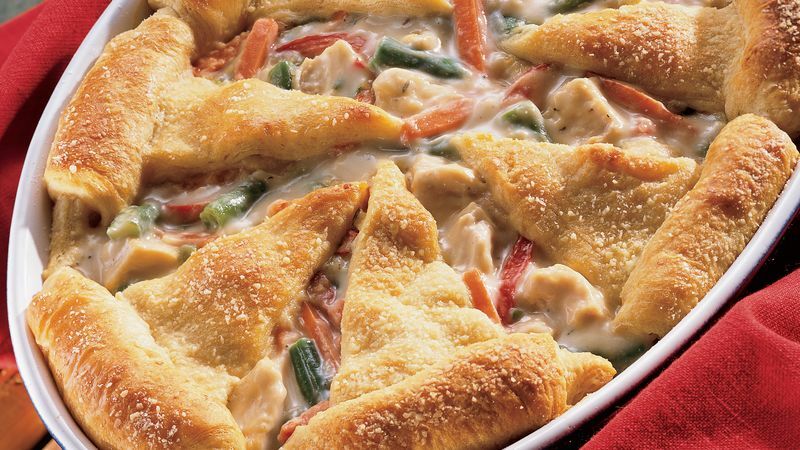 Add carrots, green beans, bell pepper and onions; cover and cook until chicken is no longer pink and vegetables are crisp-tender, stirring occasionally. Lightly spoon flour into measuring cup; level off. Add flour, Italian seasoning, salt and pepper to skillet. Stir in broth and milk. Bring to a boil, stirring constantly. Stir in 1/4 cup Parmesan cheese. Spoon into ungreased 2 1/2-quart oval casserole or 13x9-inch (3-quart) baking dish. Separate dough into 8 triangles. Starting at short side of triangle, roll each triangle up halfway. Arrange over hot chicken mixture with tips toward center. DO NOT OVERLAP. Brush crescent rolls with egg white; sprinkle with 2 tablespoons Parmesan cheese. Bake at 375°F. for 15 to 20 minutes or until crescent rolls are golden brown.